But the word of God stands forever. In this week`s Torah Portion, we are drawing nearer to the end of the Torah cycle. Its like a crescendo right now, everything from the beginning is coming together in the fifth book of Torah as Moses speaks the words (Devarim) to the Children of Israel. Can you feel it even now, as the left side of the scroll shortens, and we are coming into the last month of the Hebrew year. At the same time closer to the beginning. The Day of Atonement, the Fall Feasts that mark the end of one cycle and beginning of the next, as well as the New Year on the Hebrew calendar are approaching. God`s cycle of time is eternal and it is also clearly marked with Shabbatot and `Chagim` (Feasts). This past Shabbat is also called the Shabbat of Comfort, from the first words in the Haftarah from Isaiah, that is read in the same week. It follows a series of Shabbatot that marked some of the sad and bitter times in Jewish history. But now is a time of `Comfort`. Reading this portion, it is indeed `comforting` as there is both the Ten Commandments and the `Shema` in this week's reading. Do you know what the Shema refers to? It is the scriptures in Deuteronomy 6:4 , which start, Hear O Israel. I grew up knowing these words as the Shema, and that they are "the watchword of our faith." I am amazed when I look at my childhood, that my parents obediently followed the command to "teach these words diligently to your children." I don`t remember `learning` them, but I don`t remember ever not knowing them. Its like they were always there... and they were! And they are!! Even my years as a runaway from the God of Israel (you may know that part of my story from elsewhere on the blog! ), I still said these words as a prayer before bedtime, it was almost automatic, and I never really thought that I was keeping my connection by saying them, I just said them. Its like a piece of me wasn't rebelling and knew that they were a treasure to keep. So when I returned to the God of Israel, and said these words, it was like they really were a lifeline and felt soo....well... to use a word from this week...comforting!! As I reflect on them in reading in this week cycle, their eternal place in our lives and the way they are a direct connect to the God of Israel just spoke to me in a new way. I don't know if you were brought up saying them every day as maybe it is something that just Jewish parents teach, I am not sure, but if you don`t say them each day, I would just like to invite you to!! Like a parent teaching them diligently to a child, I would leave these words here, and if someone is reading this and inspired to begin to incorporate them into your daily prayer times, then I will have done my `mitzvot` for today. These are the words of the Shema Israel. V'ahavta et ADONAI Elohecha b'chol-l'vav'cha oovchol-nafsh'cha oovchol-m'odecha. ookshartam l'ot al-yadecha v'hayu l'totafot bein einecha. Love ADONAI your God with all your heart and with all your soul and with all your strength. These words, which I am commanding you today, are to be on your heart. You are to teach them diligently to your children, and speak of them when you sit in your house, when you walk by the way, when you lie down and when you rise up. Bind them as a sign on your hand, they are to be as frontlets between your eyes, and write them on the doorposts of your house and on your gates. 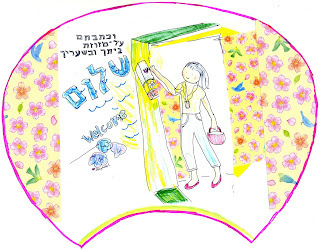 Note: A `Mezuzah`is pictured (a little exaggerated so you can see it!) in the picture. The Mezuzah is a box that contains a scroll which has written on it the words of the Shema. 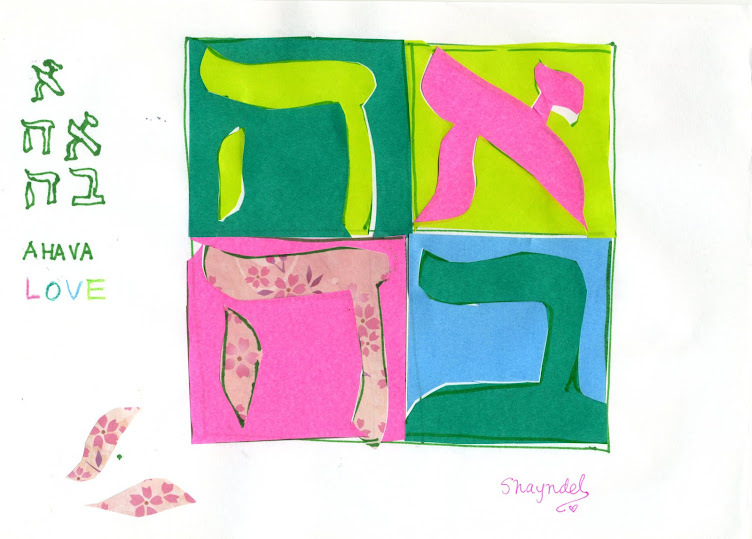 The letter `Shin` that you see drawn on it is the Hebrew letter with the sound `Sh` that starts the Shema. 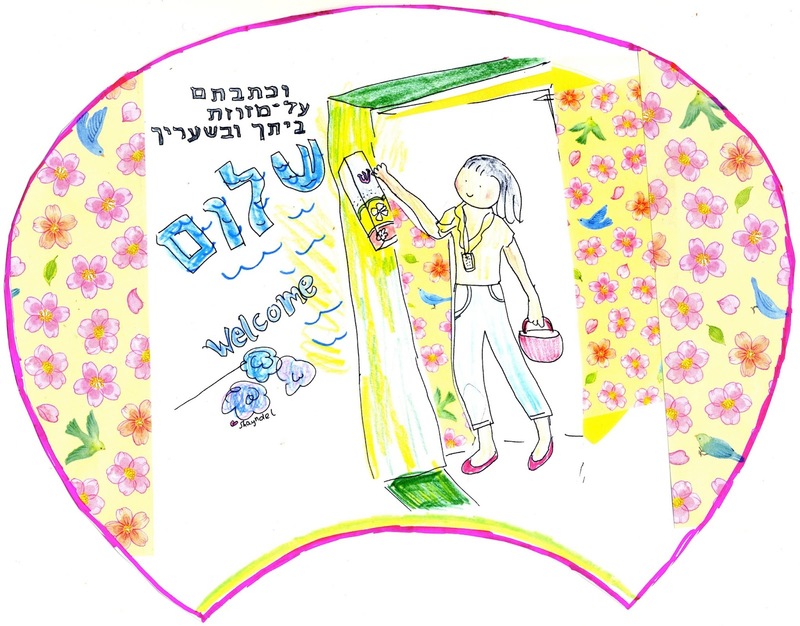 When you come in to the house it is customary to kiss the mezuzah by kissing your hand and touching the `Sh` thus acknowledging the words contained in the Shema!! Hebrew notes if you would like to read on! 1. Something I noticed as I was writing the transliteration, the word Devarim, which I have used in a few posts recently. This word is the name of the Fifth book of the bible in Hebrew and means "Words". In English we call this book, Deuteronomy. Of course the Parsha is always named after the first words in the reading, but I find it also interesting how often Devarim, or words is used throughout the book!! Other note' You can see the word "Mezuzot" in the last line in the Hebrew and it is the plural of "Mezuzah" and means doorpost. Love it! In my language it is: "Hoor o Israël!" I love it ! Thank you Aritha! The Shema Israel is the most famous and central jewish prayer. The motto of our nation.